It's super easy to just right-click, and then select New E-mail Message, and you're off to the races, no need to make Outlook the foreground or anything. However, twice now I've found this list corrupted, I right click and there is just the bottom three, and the "task" available is a "mailto:a_lot_of_garbage", and it does nothing. Productivity drops instantly. 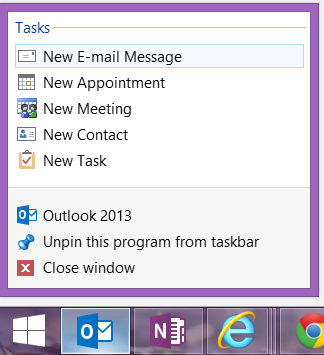 I did however managed to find this support article on tasks missing once Outlook is pinned to the task bar. It provides two work arounds, both times the first one worked. Instead of the backup, I just renamed the "LastUILanguage" key and re-opened Outlook. Unpin the Outlook 2013 icon. After you export the Outlook registry key, delete the LastUILanguage registry value. Start Outlook 2013, and then re-pin the icon. Works perfectly, thanks for this. My productivity dropped too -- I find this feature essential! I'm so happy I stumbled upon this blog. My productivity plummeted as well when I had this error. Second method worked perfectly for me. Worked perfect! Thanks so much! Great tip. We dealt with this issue for quite a while! Fantastic. Thanks a million. First method worked perfectly for me. Wow, I thought it was going to be something terrible, but this was easy to do and only took a few minutes. Really happy to have the RMB options back. Did not realize how much I used them until they were gone. EPIC Fix! Thanks! Worked for Outlook 2016 as well. I did the 15.0 and 16.0 folders and it fixed the issue! Thank you, so much!! Works! Thank you Thank you Thank you!! Productivity Returned! Yes, still a problem in Outlook 2016, and this fix still works! Worked! Thank you a lot! Perfect! Great fix. Saved some time for me there! Thanks! Worked great. thanks for posting this trick. Works perfect, even with Outlook 2016! Worked like a charm on Outlook 2016. Thanks! Just did as instructed and worked perfect. Outlook 2016. Giaonhan247 chuyên dịch vụ mua hàng trên ebay việt nam hay dịch vụ mua hàng amazon từ tổng hợp các trang web mua hàng mỹ uy tín cũng như giải đáp mua hàng trên amazon nhật có đảm bảo không uy tín không.